Modern states rarely go to war with each other. Instead, they battle non-state groups such as al-Qaedaand ISIS. Such groups, however weak militarily, will continue to pose the threat of terrorism, feeding the narrative of a “clash of civilisations” between the West and Islam. Yet the greater risk for the future will come from cyberwarfare and potentially robotic weaponry. Meanwhile, the world’s politicians will need toguard against complacency: the danger is that the United Nations and other institutions created to foster peace after the second world war are already weakening. “There has never been a protracted war from which a country has benefited.” Perhaps the wisdom of Sun Tzu’s much-quoted aphorism is now dawning on the various governments and armies who have committed such blood and treasure to the conflicts of this 21st century in Afghanistan, Iraq, Syria and Yemen — quite apart from the wars that, decades after their inception, still scar much of central Africa. Trump’s 2012 tweet makes an obvious point. It is absurd that the war in Afghanistan, beginning with US and British airstrikes in October 2001, is now four times longer than America’s involvement in the second world war. After all, unlike WWII, the Afghan conflict, whatever its repercussions, does not threaten global civilization. And yet Trump, like Obama and George W Bush before him, is unable to “declare victory and leave”, to paraphrase the cynical advice of Senator George Aiken as America became bogged down in its Vietnam war. The reality is that very few wars are simple, and arguably even fewer are quickly decisive. When France and Britain led the charge in March 2011 to oust Mu’ammar al-Qaddafi (the USA was famously “leading from behind” in the words of one White House official), the mgion, ilitary operation seemed both simple and, with the death of Qaddafi in October, decisive. Yet Libya then became a “failed state”, used as a transit point for thousands of migrants to cross the Mediterranean in search of a better life in Europe — and those migrants now challenge the cohesion, and indeed the values, of the European Union. One problem, noted over the centuries by even the kindest of observers, is that the instinct to commit violence is fundamental to mankind (and, according to today’s scientists, is exercised much more frequently than in other mammals). A related problem is that violent action is so often presented as a tempting solution to any “Gordian knot” created by endless diplomatic wrangling. As Britain demonstrated in the 19th century in its approach to China and Egypt, “gunboat diplomacy” — with military action either threatened or implemented — is a seductive policy for any superpower. Politicians become hostage to the “CNN Efect” when their voters – emotionally moved by the pictures on their screens – demand that “something must be done”. But it cannot any longer be as effective, even for the American superpower (or ‘hyperpower’, as Hubert Védrine, France’s former foreign minister, once termed the United States). One reason is the restraint imposed by the institutional architecture constructed in the wake of the Second World War. The United Nations, the World Trade Organisation, the UN Convention on the Law of the Sea, the International Criminal Court: all create impediments to immediate, direct and unilateral action — even for the United States, a country that has yet to ratify the Law of the Sea and refuses to sign up to the ICC even though it helped to create it. A second restraint is the power of the media — especially television and, increasingly, “social media” on the internet. Back in 1968 Walter Cronkite, the anchorman of the CBS network, made a reporting trip to Vietnam that discredited the optimism promoted by America’s generals. The result was to increase the American people’s disaffection with both the war and their politicians. As President Lyndon Johnson put it, “If I’ve lost Cronkite, I’ve lost middle America” — and soon afterwards LBJ decided not to run for re-election. If one anchorman in an age when three giant TV networks selected and dominated the coverage of the news in America can have such an effect, imagine the pressures on today’s politicians: a myriad of TV channels pumping out news and opinion 24-hours a day. At the same time social media, from YouTube to Facebook, will be doing the same for a third of the world’s population. In 1982 the British authorities were able to exert tight control on reporting of the war to recapture the Falkland Islands (Las Malvinas for the Argentines) in the south Atlantic. Today, such restrictions are technologically impossible when an iPhone can transmit TV-quality images from anywhere in the world. The lesson is simple: politicians become hostage to the “CNN effect”, when their voters — emotionally moved by the pictures on their screens — demand that “something must be done”. In a democracy it is a brave government that ignores the call and waits for the electorate to become bored and for the cameras to turn their lenses elsewhere. Authoritarian regimes do not feel the same pressure, but even the absolutist monarchy of Saudi Arabia has become uncomfortably aware of the reputational damage caused by its involvement from January 2015 in the Yemeni civil war. TV reports of starving children and devastated towns, coupled with the news that by August 2017 cholera had affected 500,000 Yemenis, make American and other western voters question the morality of selling arms to Saudi Arabia and its allies in the Gulf. Wars are created by many, often overlapping factors: nations come to blows over ideology, religion, ethnic differences, territory, natural resources — and increasingly the impact of climate change will become a spur for conflict. At times even the personality and ambition of a single individual will drive a nation into battle — as with Hitler in the second world war and Saddam Hussein in the Iraq-Iran war of the 1980s. But the cliché is that war is, or at least should be, a last resort. That notion is integral to the concept of a “just war”, by which Saint Augustine’s logic has given many a government over the centuries the justification to summon their citizens to a foreign battlefield. In some cases, notably the Second World War, the criteria for a just war were clearly met; in others, for example the invasion of Iraq in 2003, they were not. Hans Blix, the UN diplomat searching for Iraq’s alleged weapons of mass destruction, had argued in vain that more time was needed — yet President George W Bush and Britain’s Tony Blair were happy to announce that the “last resort” was all that remained. Intrinsic to the just-war concept is the need for a “just cause”: war can only be justified as a response to a wrong suffered. But since it is the wronged nation that determines the casus belli, there is plenty of room for interpretation. Perhaps the most egregious example is the “War of Jenkins’ Ear” (known as the Guerra del Asiento to the Spaniards), when British ships in 1739 attacked Spanish ships in the Caribbean. The pretext was to seek redress for the wrong suffered by Robert Jenkins, a British sea captain whose ear had been cut off by the commander of a Spanish patrol boat off the coast of Florida. But the redress was a very long time coming: Jenkins had lost his ear in 1731. If it suited 18th century Britain to see a casus belli only when convenient, what of America and other nations in the 21st century? The behaviour of North Korea’s Kim Jong Un provides one invitation after another to the United States and its allies in northeast Asia to abandon diplomacy and resort to war. But it is their choice whether or not to accept that invitation. When North Korea (or the Democratic People’s Republic of Korea, to use its laughable official title) on August 29th 2017 sent a ballistic missile over Japan, the government of Shinzo Abe could reasonably have claimed the DPRK’s action constituted a casus belli. But it is hard to see how such a reaction would have benefited Japan and its people. The hard reality is that any war in the region would have devastating consequences. At the very least, casualties could run to hundreds of thousands, and probably many millions, and the material damage would take years to repair. At the worst, northeast Asia would be plunged into a nuclear conflagration engulfing the Korean peninsula, Japan, China, Russia and — by virtue of its treaty obligations — the United States. Prime minister Abe rightly commented: “The outrageous act of firing a missile over our country is an unprecedented, serious and grave threat and greatly damages regional peace and security.” But rather than issuing a military threat to the DPRK (in any case difficult under the terms of the “peace constitution” adopted by Japan after its defeat in the Second World War), Abe merely called for “increased pressure on North Korea in cooperation with the international community”. 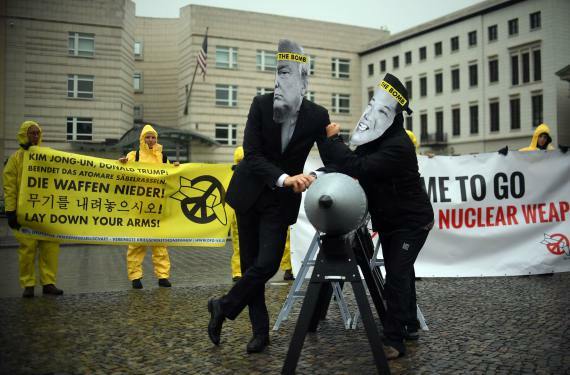 Activists of the NGO ‘International Campaign to Abolish Nuclear Weapons (ICAN)’ wear masks of US President Trump and the Democratic People’s Republic of Korea Kim Jon-un while posing with a mock missile in front of the Democratic People’s Republic of Korea embassy in Berlin in September of 2017. Let us hope so. As Churchill famously declared, “jaw-jaw” is preferable to “warwar” (his actual words were “meeting jaw to jaw is better than war”). Certainly, organisations exist for plenty of relevant jaw-jaw, from the United Nations (where, significantly, each permanent veto-wielding member of the Security Council is a nuclear power), to the Asia-Pacific Economic Co-operation forum and the Association of South-East Asian Nations. The fact that North Korea, seemingly exultant in its status as a pariah nation, belongs to the UN and few other international bodies need not be a worry. After all, the common assumption is that Kim’s ambition is not to invade others but simply to keep himself and his regime in power — in which case there must surely be diplomatic room to keep Kim in check, even if it involves what Trump calls “extortion money”. If the Korean crisis were to lead to war rather than words, it would be a rare event in recent history: in contrast to earlier centuries — including the first half of the 20th century — most wars are no longer between states. Instead, they involve states fighting against non-state actors, such as al-Qaeda; or they are civil wars; or they are wars — as in Afghanistan, Iraq and Libya — in which states join in coalitions to combat a foe collectively deemed worthy of their punishment. When one nation goes to war against another, as Russia and Georgia did for a mere five days in 2008, it is very much the exception. The reasons are not mysterious. The Second World War ended with the defeat of fascism, but with the contest between capitalism and communism yet to be resolved. Given that the leading antagonists — the USA and the Soviet Union — were (and remain) the world’s largest possessors of nuclear weapons, the contest could only be waged by proxy, especially in the developing world. The conflicts and coups d’etat in southeast Asia, Africa and Latin America all have their origins in the rivalry of the two superpowers. Even this century’s war in Afghanistan can be traced back to that rivalry, as America (along with allies such as Saudi Arabia and Pakistan) helped finance and arm the mujahideen in the 1980s to expel Soviet troops from the country. Today´s western leaders are a generation untouched by World War and, as Afghanistan, Iraq and Libya have shown, perhaps to blithe about the consequences of war. With the collapse of the Soviet Union and the near-disappearance of communism (the Chinese Communist Party makes no secret of China’s conversion to capitalism), the proxy wars that had pitted the White House against the Kremlin ended a generation ago. If there is an equivalent today, it is perhaps the struggle for influence in the Middle East between Saudi Arabia, the Arab leader of the Sunni Muslim world, and Iran, the non-Arab head of Shia Islam: their money, weapons and propaganda all inflame conflicts — notably the Syrian civil war — waged mainly by others and poisoned by religious sectarianism. However terrible today’s conflicts are for those directly affected, the world as a whole feels comfortable enough. Thanks to the European Union, armed conflict between France and Germany — which had three dreadful wars within a century — has long been inconceivable. War between Israel and its Arab neighbours is extremely unlikely (and yet in the 1960s and ‘70s pessimists worried their antagonism might escalate to a third world war). China and India have a common interest in ensuring that border disagreements in the Himalayas do not lead to a repeat of their month-long war of 1962. Even Pakistan and India (both possessors of nuclear weapons) seem unlikely in the 21st century to turn to full-scale war, despite their simmering — and often violent — dispute over Kashmir and despite the various terrorist attacks on India originating in Pakistan. Yet a comfortable world is also a dangerously complacent one. It is true that wars between states are rare, and virtually non-existent between democracies (though Russia and Georgia, with their pretensions to democracy, would doubtless dispute this). And it is certainly true that as such wars have dwindled in number, so — thanks to better medical care and generally lighter weaponry — have the casualties of war. The average annual death toll in the Second World War was at least 10 million; by contrast, according to researchers at America’s Brown University, the total directly killed between 2001 and July 2016 by the war in Afghanistan was a “mere” 111,442. But what if Trump’s rhetoric and Kim’s provocations go a step too far? What good will the UN be if a war involving the Korean peninsula draws the US and China — both permanent members of the Security Council — into military confrontation? Today’s western leaders are a generation untouched by world war and, as Afghanistan, Iraq and Libya have shown, perhaps too blithe about the consequences of war. The idea that “mutually assured destruction” would keep the world safe from a nuclear war no longer looks as convincing when Russia muses about the use of tactical nuclear weapons should there be a military attempt to reverse its 2014 annexation of Crimea. Each year world governments spend fortunes on armaments: over $370 billion in 2015, according to the Stockholm International Peace Research Institute, which also calculates that in 2016 defence budgets accounted for almost $1.8 trillion — equal to some 2.2% of the world’s gross domestic product. Those staggering figures reflect not just the responsibility of any state to defend its citizens but also the lobbying power of what President Dwight Eisenhower in his farewell address to the American people in 1961 called “the militaryindustrial complex”. Whether the spending is sensible is a question that is both political and economic. For example, in Britain critics say that Trident, the country’s submarine-based nuclear missile system, is both expensive — annual running costs are around $2.6 billion — and futile, since Britain has a “no first use” policy and they cannot imagine any prime minister ordering a retaliatory nuclear strike. But Trident’s supporters point out that it guarantees Britain a seat at the “top table” (for example in the Security Council), and is the ultimate deterrent to an aggressor. They add, too, that the nuclear-defence sector employs around 30,000. Such wrangling over money, jobs and military effectiveness is hardly new, but the irony is that the digital age is creating “cyber” weapons that are both cheap and arguably more powerful than all traditional arms. The Stuxnet computer virus — devised, it seems, by American and Israeli experts — set back Iran’s nuclear programme by months or even years and so helped pave the way for the Iran nuclear deal of 2015. A cyber-attack on Estonia in 2007 more or less closed down the country’s financial sector and came close to paralysing the government in Tallin. Since the cyber-attack on Estonia followed the government’s decision to move a Soviet-era war memorial, the assumption is that Russia was the cyber-aggressor. But there is no proof — nor is there any absolute certainty in any of the cyberattacks that have taken place in the last decade, for example on European banks or Britain’s National Health Service. It is beyond doubt that the USA, China, North Korea and Israel all have powerful cyber-weaponry, but any attack can just as easily be blamed on a clever teenage hacker operating from his bedroom. “Fake news” supporting Trump in the 2016 U.S. election turned out to come from computer-savvy and money-minded youngsters in a small city in Macedonia (the Former Yugoslav Republic of Macedonia, as Greece insists on calling the country). Meanwhile, deniability is important: NATO’s article V, the collective defence commitment under which an attack on one member — such as Estonia — is an attack on all, was designed not for the malware of the internet but for military attacks by identifiable enemies. The digital Age is creating “cyber” weapons that are both cheap and arguably more powerful than all traditional arms. Conventional warfare, with its armies, navies and air forces, is not about to disappear: it will always make sense to occupy an enemy’s territory with troops. But the advantage of cyberwar, quite apart from the difficulty of identifying the assailant, is the absence of physical casualties. “The supreme art of war is to subdue the enemy without fighting,” as Sun Tzu observed some 2,500 years before the internet. The Chinese general would surely have applauded Presidents Bush, Obama and Trump in their use of missile-equipped drones, where the operator is safely ensconced thousands of miles from their targets in countries such as Pakistan and Afghanistan. Doubtless he would be intrigued by the prospect of autonomous weapons, using advances in artificial intelligence (AI) to select their own targets. But as a philosopher as well as a general he might well share the ethical misgivings of Elon Musk and others in their call for a ban on robotic warfare. But if cyberwar defines most future wars, it will be only part of the definition. In the political crisis, and eventual armed conflict in Ukraine, Russia has used cyber tactics but has added propaganda, has fabricated news stories and has sent Russian troops disguised — thanks to their lack of identifying insignia — as civilians into combat in the east of the country on behalf of its pro-Russia secessionists. The process has come to be known as “hybrid war”, and it is bound to be used not just by Vladimir Putin’s Russia but by others too. After all, propaganda and “fake news” are as old as war itself: witness their use in the wars of the 20th century, from the First World War onto the Vietnam War. In 1993 Samuel Huntington, a leading American political scientists, wrote an article in Foreign Affairs arguing that future wars would be fought not between nations but between cultures. “The Clash of Civilizations?” identified a clutch of cultures: Western; Latin American; Islamic; Confucian; Hindu; Slavic-Orthodox (i.e. the Christianity of Russia and Eastern Europe); Japanese; and, possibly, African. Huntington’s thesis, later turned into a book, was a bracing rebuff to the assertion in The National Interest by his former student, Francis Fukuyama, that the world had reached “the end of history”, since the collapse of communism marked “the end point of mankind’s ideological evolution and the universalisation of Western liberal democracy as the final form of human government”. Confronted by the dismal realities of the wars in Iraq and Afghanistan, Fukuyama, who had been part of the neo-conservative camp so influential in the presidency of George W. Bush, has since admitted that the triumph of Western liberal democracy may have to wait. But does that mean that Huntington’s thesis, dismissed by many as simplistic, will prove to be right? Thucydides, writing some two and a half millennia ago (making the Greek historian a near-contemporary of China’s Sun Tzu), observed that the 30-year Peloponnesian war between Sparta and Athens began because Sparta, the “superpower” of the region, feared the growing power of Athens. Harvard’s Graham Allison calls this the “Thucydides Trap”, and he and his colleagues have identified 16 examples over the past 500 years. In 12 instances the result was war (for example, between France and a rising Germany in the 19th century); in only four was war avoided, most notably when Britain accepted the ascendancy of America in the early 20th century. A more modern example, of course, is that Britain and France, victors over Germany in two world wars, have accepted the rise of Germany as the economic power of the European Union. The question in the decades ahead is not whether America, the acknowledged global superpower, will find itself challenged by the inexorable rise of China — but how America will react. Professor Allison, writing in 2015, is pessimistic: “Based on the current trajectory, war between the United States and China in the decades ahead is not just possible, but much more likely than recognized at the moment.” Given that economic power and military power usually go together, he could well be right, though it is worth pointing out that America accounts for some 40% of global defence spending and that, on current trends, it will be another two decades or so before China matches America’s level. It is also worth noting the anti-China rhetoric, both in tweets and speeches, of Donald Trump. As Allison notes, “When a rising power is threatening to displace a ruling power, standard crises that would otherwise be contained, like the assassination of an archduke in 1914, can initiate a cascade of reactions that, in turn, produce outcomes none of the parties would otherwise have chosen.” Is Trump unwittingly creating such a crisis? Or is China, with its “island-building” in disputed areas of the South China Sea? Any clash between China and the United States would give some credence to the notion of a “clash of civilisations” — but much more convincing evidence is the rising influence of what is conveniently called “Islamism”, a fundamentalist reading of the Quran and the sayings (hadith) of the Prophet Muhammad. The “clash” between the west and Muslim extremism is undeniable in the context of al-Qaeda, ISIS (or Islamic State, following its assertion of a new caliphate), the Taliban, Boko Haram and sundry other Islamist groups. After all, they make no secret of their opposition to democracy and to Western values and behaviour — and the Western response, in the form of the wars in Afghanistan and Iraq, has helped spread a view commonly held throughout the Muslim world that the West is at war with Islam. When the Islamic State announces its determination to recover al-Andalus, as it calls what in the Middle Ages was Muslim Spain, it hopes to remind all Muslims of their emotional affinity with the era when the Islamic world — not the Christian one — was the centre of knowledge and civilisation. But for a genuine clash between Western civilization and Islam to occur, the tenets of the Islamist extremists have to take hold in the Muslim world as a whole. They are uncomfortably close to the teaching of Wahhabism, the austere doctrine, harkening back to the earliest days of Islam, which has held sway in Saudi Arabia ever since the kingdom was created in 1932. Though Saudi Arabia welcomes Shia Muslims for the pilgrimage to Mecca (a duty, health permitting, to be fulfilled at least once in a Muslim’s lifetime), many Wahhabis consider Shi’ites to be apostates — and under their interpretation of Islam, apostates should be killed (ISIS, of course, would agree). To the dismay of moderate Muslims, Saudi Arabia has poured billions of its oil wealth into creating mosques and madrassahs (Islamic schools) that have disseminated the Wahhabi message throughout the world. Ironically, the message has come back to bite the Saudi royal family: both al-Qaeda and ISIS consider the Saud family corrupt and hypocritical — and so a target for attacks. Indeed, even before al-Qaeda and ISIS existed, extreme fundamentalists have acted against the regime, for example with the bloody seizure of the grand mosque of Mecca in 1979. Despite all Saudi Arabia’s largesse, it is hardly likely that fundamentalist Islam — too alien to the social and economic demands of the 21st century — will gain majority support in a Muslim world that runs from Morocco in the west to Indonesia and the southern Philippines in the east. But quite conceivably a more moderate Islamist message, preached by the Muslim Brotherhood since its foundation in Egypt in 1928, could take hold. Under President Recep Tayyip Erdogan’s AK (Justice and Development) Party, modern Turkey is rejecting the secularism of Ataturk. In Morocco, the government is headed by the Justice and Democracy Party, also an advocate of moderate Islam. Both these parties are inspired by the Muslim Brotherhood, which has made gains in Tunisia and even in the monarchies of Jordan and Kuwait. The question in the decades ahead is not whether America will find itself challenged by the inexorable rise of China, but how America will react. Given the example of Turkey (a member of NATO since 1952, albeit under secular or military rule), the West can clearly cope with Brotherhood-inspired governments. (Ironically, it is Arab regimes that find it difficult, hence the military coup in Egypt in 2013 against the democratically elected — but inept and authoritarian — Muslim Brotherhood government of Mohammed Morsi). The much more pressing question is how well will the West cope with the message of al-Qaeda and ISIS. Military defeat for the Islamic State has always been inevitable, though at immense cost in civilian lives. As intelligence agencies and their technologies become ever more expert, al-Qaeda will find it ever more difficult to match the extraordinary attack on America of September 11th 2001. But military setbacks for Islamist groups have yet to amount to any final surrender: simply put, if they consider themselves guerrillas, survival becomes a form of victory. As Henry Kissinger once said of the Vietnam War, “The guerrilla wins if he does not lose. The conventional army loses if it does not win.” Governments around the world, including in Muslim countries such as Indonesia and Pakistan, know full well that there is no perfect defence against determined terrorists. In Western Europe, where several countries have significant Muslim minorities, governments have to recognise the impossibility of defending against low-technology attacks by individuals responding to the call of an embattled ISIS to attack “infidels…in their homes, their markets, their roads and their forums”. All the defence spending in the world, and even the best-trained armies and police forces, can never stop a truck being driven into a crowd of innocents — as on Nice’s Promenade des Anglais in July 2016 or Barcelona’s Las Ramblas in August 2017. What would stop such atrocities would be better governance in the Muslim world (religious extremism breeds rapidly when youthful populations are jobless and joyless) and better integration of Muslim minorities in the Western world. Since neither remedy looks imminent, governments and security forces will find themselves hostage to the threat of terrorism for some years yet. Meanwhile, fuelled by corruption, ethnic tensions and the quest for natural resources, the conflicts of Africa will stubbornly continue. So too will the drug wars of Latin America (where the peace deal of 2016 and 2017 between the FARC guerrillas and the Colombian state is a rare, and welcome success). 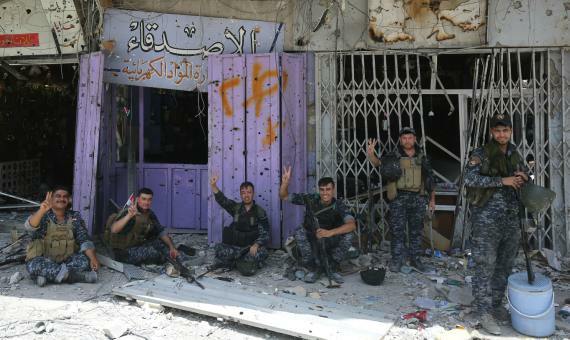 Members of the Iraqi federal police flash victory signs in celebration in the Old City of Mosul. But the real challenge is for politicians and ordinary citizens to recognise and safeguard the extraordinary gains made since the ending of the Second World War. In the ensuing decades the world’s population has tripled but poverty has fallen so dramatically that fewer than 10% now live in what the World Bank calls “extreme poverty”. Much of the credit must go to the institutional architecture — notably the United Nations, NATO and the EU — set up to consolidate peace and rebuild a shattered world. There will always be wars, hopefully more minor than major. Yet it would be tragic if the institutions that have kept the world more at peace than at war were now allowed to decay in today’s atmosphere of resurgent nationalism and populism. Andrews, John. "War and Peace (and in between)." In The Age of Perplexity. Rethinking The World we knew. Madrid: BBVA, 2017.